Thank you to everyone who has knitted, sewn or crocheted for us! We have been overwhelmed by the amazing response to our appeal for #tedsforbeds. You've been so generous in your crafting, that at this time we have enough #tedsforbeds for our Emergency Safe-house Shelter, but if you are part way through making a ted or you have just finished one, we would still be delighted to receive them for one of our other projects in the Niger Delta. Sarah's little ted is currently winging his way to our Safe-house in Calabar, Cross Rivers State in the Niger Delta. We hope he will bring comfort to a child as they take their first steps to recovery and a future free from fear. 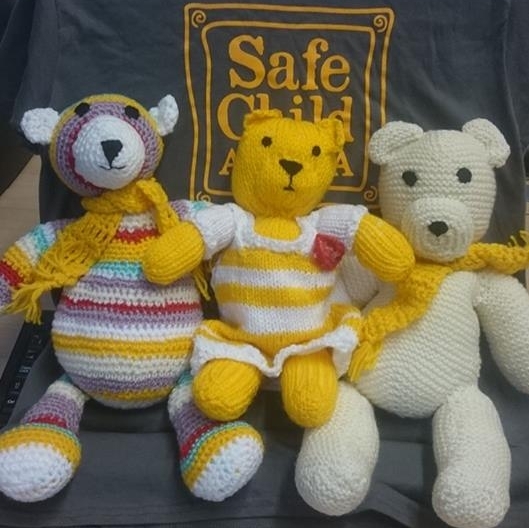 Could you (or someone you know) knit, crochet or sew with love so that every child who arrives at our Safe-house has a #tedsforbeds 'ted' waiting for them to cuddle? Our Emergency Safe-house is a temporary accommodation facility. We expect children to stay with us for up to 7 nights while a more suitable, longer term solution - such as foster care - is found. With 8 beds, and an expected duration of up to 7 nights, we expect that a vast number of children will pass through our Safe-house, so we need a vast number of #tedsforbeds! The boys and girls we support range in age from 0-15 with the majority being under 10 years of age. If you would like to help, we would be delighted and incredibly grateful. Please read through these guidelines before you start, and let us know if there's anything else you would like to know, that we haven't covered. Frodo and his #tedsforbeds buddies! Please make your #tedsforbeds creations from wool, acrylic yarn or fabric so that they are washable. Please ensure that all seams and closures are super secure. Our children can be as young as 0- 3 years old, so please avoid using fixings (such as eyes, noses etc) if there is a risk they could break away and cause a choking hazard. Sewn/stitched features get round this problem or using child-safe eyes and noses is fine. Please aim to make your #tedsforbeds creations between approx 15cm and 30cm in length - we request these limits because we have to post them to Nigeria or fit them into our suitcases when we visit! Therefore the smaller they are the more we can fit in. That said, if yours is a little bigger, it isn't a problem. Friends come in all shapes and sizes and that's true for our #tedsforbeds too! We welcome toys in the shape of frogs, rabbits, lions, monkeys, dinosaurs, cats, birds, meerkats, fish...whatever takes your fancy. Perhaps you could knit a cuddly train, bus or car? Our shelter is available to both boys and girls, so if your toy isn't gender specific, even better! And if you want to go traditional, teddy bears are always welcome too! Here are some free patterns that might be useful. None of these have been tested by any of our team and none of these blogs/sites are affiliated to Safe Child Africa in any way. There are many other FREE patterns available online. You can make 1 or 100, there really are no absolutes in terms of quantity, because there are always children in our projects who will need - and treasure - a #tedsforbeds 'ted'! We will dispatch the toys in phases, and by the most economical means - taking them with us on visits where possible to reduce postage costs. If you would like us to let you know when yours have been dispatched to Nigeria, please include a note with your toys, together with your full name and e-mail address. Due to safeguarding and respecting the confidentiality of the children we look after, we aren't able to provide detailed feedback or photographs regarding the child who has received your gift. When your #tedsforbeds are ready, please send them to our Manchester address, at the bottom of this page. It would be helpful if you could drop us a message - so we know to look out for them. If you are sending a large quantity or as part of a group, it's worth messaging us before you post, just in case we can collect or meet somewhere to save postage for you. .Any more questions? If there's anything else you want to know, please ask!